Learn more about the world of eco-friendly fibers on Knitting Daily episode 313. Guests share some of the ways that yarns are being made more sustainable and better for the environment. Plus, learn how to go green with some great projects using these yarns. Getting Started – Lace is the perfect way to stretch those unique eco-friendly skeins of yarn. Eunny begins with a lace primer on yarn-overs and decreases. Download 13 tips and tricks for improving your knitting, from the hosts and guests on Knitting Daily. Designer Spotlight – Adina Klein joins Kim to talk about the creation process and attributes of “green” yarns. Plus, she shares how different yarns properties lend themselves to specific garments or looks. Download the pattern, a carry all made of eco-friendly yarn. 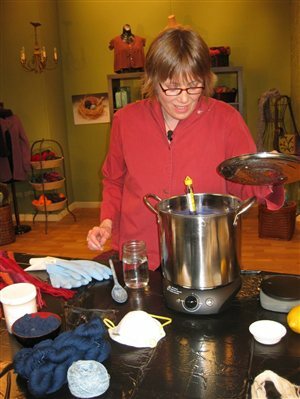 How-To – Liz demonstrates how to dye yarn the eco-friendly way using natural materials like indigo and madder. Yes, you can dye your own yarn in the comfort of your kitchen using proper safety measures. Did You Know? – Kathy Elkins is back with tips for working with bamboo, linen, and sisal yarns; popular yarns on the market that you can feel good about knitting with. All the yarns shown in this segment are available at WEBS yarn store.